Our 10th Titled Arena takes place on the 5th of January, 19:00 UTC. Just before the Tata Steel Chess tournament, start the year with some high quality bullet and come enjoy the 10th Titled Arena on Lichess. 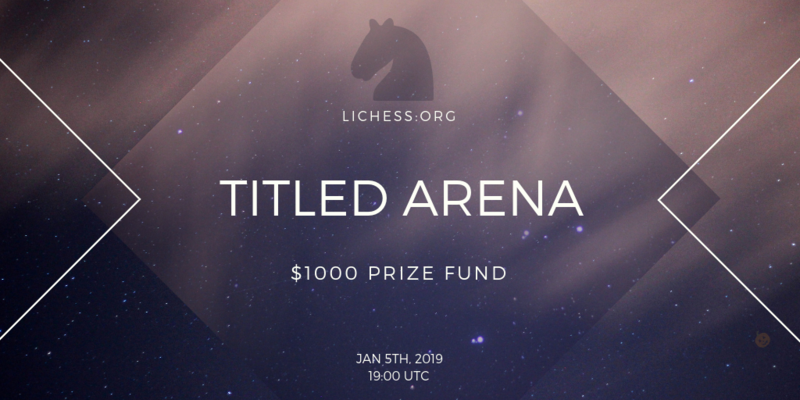 As usual, the tournament will be preceded by a Warm-up Arena, open to all players on Lichess (with a minimum of 20 rated bullet games). If you are new to Lichess, it's important to become familiar with the arena tournament format. Read our FAQ and consider trying out an arena tournament in advance. Arena points are awarded based on the number of games you win. If multiple players finish the tournament with the same number of points, tournament performance is used to break the tie. Prizes will be awarded within three days after the event, through PayPal, BTC or Euro wire transfer. To participate in the Titled Arena events, you need a verified titled account on Lichess. If you don't already have a Lichess account, create one. Then, to get your FIDE or NM title verified, please fill out this title verification form, and we will process it within 24 hours. If you already have verified your title on Lichess, you don't have to do this again. When your title has been verified by us, you will be able to join the tournament. We've had a bunch of players streaming the previous Titled Arenas, including Magnus Carlsen, John Bartholomew, Eric Rosen and ChessNetwork. We encourage both participants and fans to livestream the tournament. If you plan to, check out our small streamer's kit for some useful graphics to include in your overlay.